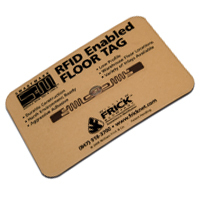 William Frick and Co., producer of custom labeling products, has expanded their SmartMark line of durable RFID tags to include rugged floor tags. Designed to handle the rigors of warehouses and high-traffic retail environments, the floor tags can be used to identify critical areas and track pallets, displays and inventory. The tags use passive UHF Gen 2 inlays and are easy to integrate into existing systems. The SmartMark labels can also incorporate bar code and human readable character, which can help managers to merge technologies and meet compliance requirements. “Our SmartMark durable RFID products make it easy for managers and staff to find what they’re looking for and speed up work flow. Plus, we know how to build solutions that last – even on the dock or in harsh environments,” explained Jeff Brandt, executive vice president for William Frick and Co. in a press release.